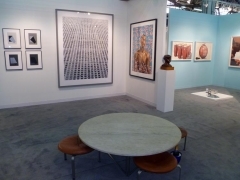 Sean Kelly is delighted to announce that the gallery will be exhibiting at the Armory Show (Booth 701, Pier 94). 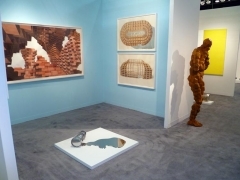 As the focus of this year's fair is art from Latin America, we will showcase works by Argentinian artist Leandro Erlich, Brazilian artist Iran do Espírito Santo, and the Cuban duo Los Carpinteros. Timed to coincide with the fair, the gallery's current exhibition of new works by Los Carpinteros, Rumba Muerta, is on view at the gallery at 528 West 29th Street (through March 19, 2011). In addition to the strong presentation of our Latin American artists, our Booth at the Armory will feature carefully selected works by gallery artists Marina Abramović, James Casebere, Antony Gormley, Laurent Grasso, Johan Grimonprez, Rebecca Horn, Callum Innes, Joseph Kosuth, Wolfgang Laib, Robert Mapplethorpe, Juliao Sarmento, Frank Thiel, Gavin Turk and Kehinde Wiley. On Thursday, March 3rd from 7 to 9pm at Phillips de Pury downtown at 15th Street, Laurent Grasso will participate in a panel discussion organized by cultural consultancy "360 Bespoke". The panel is the second installment of "Fizzy Water: Emerging Trends in European Contemporary Art" and will address new trends in European sculpture today. An Armory Circle Card and RSVP is required for admission. For more information please visit http://www.three-sixty-degrees.com. On Friday, March 4th from 5pm until 6.30pm at the Armory Circle Lounge on Pier 94, the gallery will host a book launch for Belgian artist Johan Grimonprez's latest book It's a Poor Sort of Memory that Only Works Backwards. The book includes film scripts and a selection of interviews and essays about three of the artist's most influential works: Double Take, Dial H-I-S-T-O-R-Y and Kobarweng or Where is Your Helicopter?. The artist will be on hand to sign copies of the book. Please contact the gallery at info@skny.com to RSVP if you wish to attend the book launch. Also on Friday, March 4, the gallery will stay open until 8pm to allow visitors to the fair to view Rumba Muerta, Los Carpinteros' exhibition. Rumba Muerta brings together the artists' newest works including large works on paper and three large scale sculptural installations. The exhibition will remain on view at the gallery through March 19, 2011. 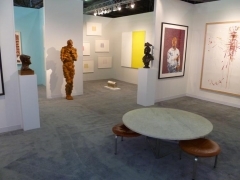 The Armory Show will be held at Piers 92 & 94 (Twelfth Avenue at West 55th Street) and will run from noon to 8:00pm on Thursday, March 3 through Saturday, March 5, 2010, and on Sunday, March 6, 2010 from noon to 7:00pm. For press inquires, please contact Maureen Bray at maureen@skny.com or call the gallery at 212.239.1181. For all other inquiries, please contact Cécile Panzieri at cecile@skny.com or call the gallery at 212.239.1181.